How deadly is toxic mold and what is it? Toxic mold is a term used to describe molds considered potentially deadly to humans. They are the “beware of molds”. Mold can be destructive and deadly. Essentially there are 5 major groups of toxic mold that are essential to kill and prevent. There are hundreds of species considered deadly to humans. Toxic molds can produce mycotoxins or poison. Some of these toxic molds can produce hay fever and allergic like symptoms while other folks are not so lucky. They can end up with pulmonary edema, brain or nerve damage and even death. Stachybotyrs is considered the bad boy of molds as it is the most deadly. This is the black mold that many associate with fatality. 8.Brain or Nerve Damage very serious! This is the mold that killed 8 infants in Cleveland from 1994 to 1996 were due to plumbing leaks flooding and cigarette smoke. Tragic. The most susceptible to serious illness from this toxic mold are the very young, children due to developing lungs and the elderly. Stachybotrys is a greenish black color. It rapidly grows, maturing in 4 days according to Dr. Fungus. Color of Stachybotyrs: cottony turns black in 4 days. 1.Allergic Bronchpulmonary Aspergiliosis: caused by hypersensitivity to aspergillus spores. This essentially becomes a breathing problem treated with steroids and anti-fungal meds. 2.Acute Invasive Aspergiliosis: grows in cavities in the body; usually created by something like a fungal ball grows causing the patient to cough up blood, have problems breathing, malaise, and weight loss. Treated with anti-fungal meds, like Itraconazole which are shot into where the fungal ball is.. This is a short list of what thought to be seems to be between 100,000 to 400,000 varieties of mold. To thoroughly kill mold: clean the area with effective mold killing product and use a quality HEPA vacuum. 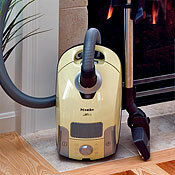 Miele is one of the premier vacuums. Effective, top notch. Using is believing. Miele Galaxy Series S4210 Carina HEPA Optional (Melon Yellow)- Deluxe PackageDeluxe Package: Includes combination carpet/floor tool, standard accessories plus a parquet floor brush (good for bare floors, high polished floors, and occasional scatter rug).